Calligraphy for Everyone! "Calligraphy, Lessons, Free Sample, Books, Tips, etc." with Jim Bennett B.F.A., M.F.A. Calligraphy means"beautiful writing." Calligraphy can be both a delight to the eye and an inspiration to the spirit. In our technological age, the appreciation for the art of calligraphy has grown incredibly. Calligraphy is a fun hobby, a great business, and a creative art. 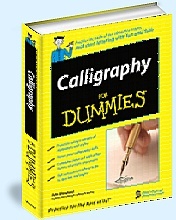 This web site is dedicated to helping people learn calligraphy. alligraphy is an art that just about anyone can do. All you need is a pen and paper, and you're ready to do calligraphy! Indeed, it requires very few materials - you don't need very much space - and, since you can probably write anyway, you already know the basics! Calligraphy is a whole lot of fun and can be enjoyed by young and old alike. I have had students as young as 7 years old and as old as...(well, maybe I"d better leave that one unsaid!). It is one of the most enjoyable skills that a person can acquire. In short, calligraphy is really FUN! There are some wonderfully gifted calligraphers (see links) whose work can inspire us to strive for excellence. However, no one should ever look at work of this calliber and conclude that there is no room for amateurs. Remember, in the end, we are obligated to please just one critic - ourselves. There are a lot of ways that people can use use their calligraphy. Just look at the list below of things you can create. What's more, you'll have the opportunity to use your calligraphy skills every time you write! Send me your name by e-mail, and I'll e-mail you a graphic of your name done in calligraphy. If you send me your physical mailing address, I will mail you a card with your name done in my fanciest calligraphy. NO CHARGE - IT'S FREE! Visit my store for recommended materials: books, pens, and paper. If you have any interest at all, I encourage you to get started right now. I've even included a lesson that you can print on your printer. Click here to go to the lesson. Many people begin calligraphy merely as a hobby, but soon discover that it can also turn into a lucrative source of income. There are lots of ways to make money by doing calligraphy including announcements, certificates, invitations, and restaurant menus. Click here to see tips for making money with calligraphy. NEWS FLASH! - First On The Web! If you appreciate calligraphy, you surely will enjoy visiting the sites in the Calligraphy Ring. If you have a web site or can recommend a web site that has calligraphy on it and you would like to see it become part of one of The Calligraphy Web Ring, please use this link. Just Click to Get Today's Hot Tip! HAVE YOU SEEN THE BEST ONLINE DISCOUNT ART SUPPLY STORE? The Sightseer Train stops at this site. Click here to ride to another art site. The Hobby Train stops at this site. Click here to ride to another hobby site. You Can Learn Calligraphy Online! My popular, completely hand-lettered book "You Can Do Calligraphy!" is now online! This book has been in print since 1982 and has been used in several schools. It is aimed at helping the beginner. Students comment that this book, compared to the many other great books on calligraphy, makes learning calligraphy the easiest and the most fun of all! Now you can access my book right from the Internet! Learn calligraphy right online. "You Can Do Calligraphy!" will teach you how to do 5 of the most popular alphabets: Italic, Blackletter (sometimes called "Old English"), Roman, Bookhand, and Uncial (the most expressive of all). It also contains projects you can do. In 10 easy lessons, you will learn the basics so that you can progress quickly from a beginner to an intermediate calligrapher. Click here to view the actual table of contents. I'll send you a card with your name done in calligraphy!